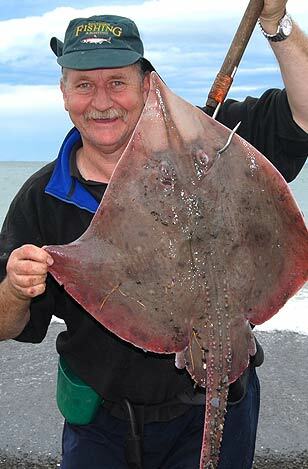 The author with his 830mm long skate that won 4th prize in the 2010 Amberley Lions Surfcasting Contest. Amberley Beach is situated 40 km north of Christchurch. It wouldn’t be my first choice destination for a surfcasting trip from Christchurch. This beach doesn’t seem to produce anything like the numbers of fish that can be caught in the Canterbury Bight south of Banks Peninsula at places like Birdlings Flat. I’m uncertain why this should be. Possibly the water being a bit shallower tends to warm up more over summer. The sea floor off Amberley beach is largely sandy and featureless. The Waipara River is little more than a creek and is not open to the sea. 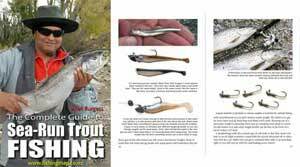 Perhaps if the river were larger with a good flow the surfcasting might be better. Twenty years ago many of the locals would set gill nets along the beach at low tide targeting rig sharks. With the set net ban now in place, you no longer see their net floats bobbing in the surf just off the beach. Several of the locals, one of whom is a close relative, report that the catches in recent years from the nets before the ban came into force, were nothing like they had been in the past anyway. 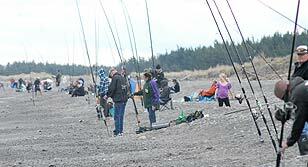 Tuatua are found on Amberley beach and make good bait. However, you need to tie them on the hook with bait elastic so they don’t fly off when casting. Tying on you baits also make it harder for crabs and small fish to take your bait and so increase your chance of catching a bigger fish. Amberley Beach Surfcasting Contest looking south-west. Amberley Beach is well known for the large population of paddle crabs just behind the breakers. These tasty pests take great delight in robbing surfcasters of the bait from their hooks. At certain times of the year, there must be huge numbers of swimming crabs present because they can strip your hooks of all their bait within just a few minutes of being cast out. You can get your revenge on these robbers every now and again as the odd one gets tangled in your terminal rig. They are excellent eating if you can catch them. The crabs are also much larger specimens at Amberley Beach then the smaller ones regularly caught from the New Brighton Pier. It should be possible to make some sort of terminal rig with treble hooks which you could bait up and cast out to snare the swimming crabs. They are excellent eating. At least as good a crayfish! 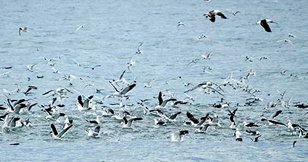 Seabirds working a school of baitfish along the beach. There would almost certainly be kahawai present. On occasion, I have fished Amberley Beach when the fishing has been fairly good with catches of spiny dogfish and red cod in reasonable numbers. 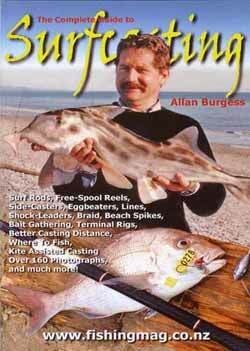 However on the 10th of January 2009 catch ratios for entrants in the Amberley Lions Surfcasting Contest were fairly poor. Sea and weather conditions for the big day were excellent for surfcasting with an offshore northwesterly breeze, an overcast sky, and warm temperatures. The contest ran from 9 am through to 3 pm. Not long after the event started a large school of bait fish moved slowly along parallel to the beach starting from the Waipara River mouth and headed towards Banks Peninsula. These baitfish, or possibly krill, were constantly attacked from above by large numbers of screaming birds. They almost certainly would also have been preyed upon from below by a school of kahawai. Unfortunately, this surface action was all happening about 200m from the beach – though any accompanying kahawai may well have been closer. Amberley Beach Contest looking northeast. If I wasn’t fishing in the surfcasting contest I would have started casting a ticer with my long 13′ salmon rod and Abu 7000 reel. The idea is to wind flat-out to imitate a fleeing baitfish. However, when entered in a surfcasting contest you can only fish with one rod – though some contest organizers allow you to pay for two entry tickets and so fish with a second rod. I was using my big 16′ Kilwell rod and Alvey 650c. A setup designed for casting heavy weights long distances rather than high-speed spinning. Kahawai prefers to chase their meals and so are more readily caught on a moving ticer (hex wobbler). However, I’m sure that had the school come close to the beach contestants would have started picking them up on their baited surfcasting rigs. According to the bloke on a motorbike who was measuring fish that had been caught, most of the fish landed were caught at either end of the beach with only a few being taken in the middle. Where I was I only saw three fish landed all day: two skates (one of which I landed) and a paddle crab. A mate of mine who had been fishing in the middle of the beach reported that “he hadn’t seen a fish landed all day.” At the prize giving the organizers mentioned that some 80 fish had been caught. We were all quite surprised to hear this. Perhaps most of these fish were crabs! Another skate. This was the only other fish I saw landed. The skate I hooked was taken a long way out at full casting range while the other one caught near me was taken close to the beach. When surfcasting nowadays I routinely bait up two rigs. I cast one out and then hook the second rig over my beach spike (rod holder made from a long metal Waratah fencing standard). If I haven’t caught a fish after ten minutes or so, I wind in, and unhook the first rig from the genie clip and toss it on the ground while still holding my rod in its pouch around my waist. Then I attach the second rig with it’s already freshly baited hooks and quickly cast out again. I then re-bait the first rig. This enables me to keep freshly baited hooks in the water at all times – an important consideration during a surfcasting contest. The reason I toss the used rig on the ground is to avoid any possibility of it becoming tangled with the second rig hanging on the rod spike. The 2010 Lions Amberley Beach Surfcasting Contest certainly proved to be “the day of the skate.” Not a fish that you would normally want to catch. Skate prefer a soft sandy seabed which might explain why they were caught here. The contest winners were determined by fish length rather than weight. That being the case a conger eel, shark, or maybe even a big barracouta would have been a good catch. Congers are normally associated with the foul rocky ground which explains why plenty of congers are often among the prize-winning fish at Kaikoura and Nape Nape. Notwithstanding the low catch rate, the Amberley Lions Surfcasting Contest was well organized on the day and the proceeds go to a worthy local cause.